Three trios played by three musicians give the disc its title, 3X3, which the recital producer admits in the booklet is by no means original. That said, the three they have chosen to showcase are brilliant examples of the genre and two of them, the Shostakovich and Weinberg, are all too rarely heard. The Shostakovich is a really early work written when he was only 17, and which shows the talent that was going to flourish into one of the most significant composers of the twentieth century. I cannot agree with the note by Ekaterina Biryukova when she says that his “recognisable language” isn’t to be found in it. If that is the case, what is it in the work that identifies it as being by Shostakovich and which could have been written by no other? True, it has none of the biting satire or world-weary outpourings that can be found in so many of his works, but there is plenty in it that reveals its composer. One of his characteristically cheeky tunes emerges before the first minute is over, which as quickly segues into a more melancholy mood, and two minutes in, changes again into a reflectively nostalgic little episode (how can one so young feel nostalgic? It makes you think he must have been here before!). Nostalgia fades into wistfulness, then Shostakovich’s puckish side takes over with a jaunty little tune before we return once more to nostalgia, with the violin taking that role ably accompanied by a similarly yearning piano and cello and it is in this mood that the work ends, albeit with some flourishes that suggest that we needn’t take it all too seriously. This is a brilliant work for a seventeen-year-old to have written, and one that deserves to be heard far more often than it is. 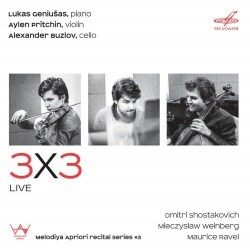 What a contrast we are presented with in the shape of Weinberg’s piano trio, which is possessed of all those elements of Shostakovich’s work but which has an overarching structure and a palpably plangent overtone. Just as many artists and writers have reflected their most horrific experiences in their paintings and books, so Weinberg expresses his own nightmarish past in this sober yet beautiful work. By the relatively young age of 26, Weinberg had already had to flee his native Poland in the wake of the Nazi invasion, leaving behind his parents and sister, all three of whom later died in a concentration camp. We can only imagine the total desolation someone must feel in such ghastly circumstances but this work gives us an insight into his frightful and desperate state of mind at the time of writing. I shall not attempt to dissect it for it is a work that is such a sum total of its parts, it would be wrong to try to do so except to disagree once again with Ekarerina Biryukova’s assertion that nothing of Shostakovich’s characteristic language is to be found in it. They met in Tashkent while both were evacuated there and the older composer took the younger ‘under his wing’. Though Weinberg was never Shostakovich’s pupil, he always regarded Shostakovich as his teacher. Of course, it is true that Weinberg had his own distinctive musical language but nevertheless there are unmistakeable traces of Shostakovich’s influence in this work whether by design or coincidence. It could be said that musically the two composers had so much in common that they thought alike; certainly they enjoyed the same devices that pepper their works, all of which makes the two of them the most fascinating composers. If, like me, you enjoy music that is poignant and heart-breaking because it taps into your soul, then this is as perfect an example of these elements as you are ever likely to come across. If you know Ravel’s piano trio, its opening must be one of the most recognisable in all music. The first 14 notes on the violin are as much a signature as any I can think of. Their dreamy nature seems to contain the essence of the world he knew and loved before the outbreak of the First World War that would change that world forever, destroying as it did the hopes of an entire generation along with millions of young men whose future promise was so cruelly extinguished. Its influence is drawn from the Basque dance form known as the zortziko and Ravel, whose family was of Basque origin, wrote the trio in the Basque town of St–Jean-de-Luz. The bulk of the trio was written prior to the outbreak of war and though the third movement seems to be influenced by the darkness that would descend across Europe, the main impetus for Ravel was his determination to get it finished in time to enlist in the army, despite his unfitness for active service. The last movement is sunnier, though it still reflects regret for a world about to suffer profound and lasting change. I always feel that Ravel, with his absolute mastery of colour in music, took on the mantle left by Debussy and is the most painterly of all composers who came after him; as someone said about another composition, not one note could be added nor a single one taken away; it really is that perfect. These three young Russians (Lukas Geniušas is Russian despite his family name being Lithuanian) are obviously at home with the repertoire of both Shostakovich and Weinberg and as such deliver convincing and muscular performances of both of their works, but equally impressive is their ability to enter the sound world of Ravel, whose essence is so much at variance with the other two, with its lush language and Basque-influenced harmonies. With utterly persuasive arguments in favour of all three works they provide every reason for ensuring the Shostakovich and Weinberg will be heard on a more regular basis.